MAUI was named the Best Island in the World by the readers of Conde Nast Traveler magazine and Heavenly is the only way to describe the Kaanapali Beach Resort Community. Maui has finished first 16 times out of 20 in the magazine's Readers' Choice Awards for Best Island in the World and has never finished lower than first among Pacific islands in the 20 years the readers have ranked islands. A beautiful soft golden sand beach with crystal blue ocean shore greets you each inspiring morning from your bed directly. Repeatedly voted by distinguished travelers to be one of the best beaches in the world, Kaanapali has proven to be the most desirable travel destination. Delight in a vibrant beach front setting with world class shopping & dinning along with the many beach activities...... all within your eye’s view. Discover and enjoy intimate warmth and charm of this 1BR/2 Full Bath on the 11th floor with 2 LCD TVs. The Whaler tower has 12 floors in total. Located on the outer side of Tower II overlooking the Whaler Village with a view of the ocean on one side, and golf course plus mountains on the other side. This is your opportunity for a story book vacation experience. Beautifully designed interior enhances Hawaiian lifestyle that reflects charming tropical character. A captivating Pacific Ocean view with a gorgeous backdrop of Island of Lanai is seen from the couch in the Living Room or your comfortable bed in the Bed Room. Relax in the tropical breezes and the sounds of the surf as you watch whales (Dec-April) and dolphins dance in the ocean. 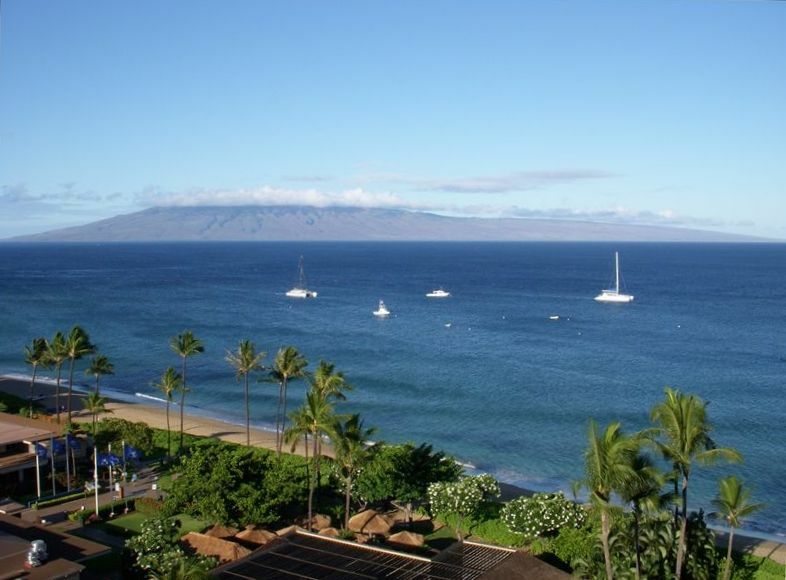 Your view on the other side extends to the ever changing and dramatic panorama of the West Maui mountains along with beautiful Royal Kaanapali Golf course, all the way to Historical Lahaina. As if this is not enough inhale ultimate picturesque golden yellow, orange to red sunset with tropical drinks in-hand and soft Hawaiian music from your Lanai or choose to watch it from your couch in the LR or bed in the BR that will create long ever lasting memories. For you Golf lovers, golf at the Royal Kaanapali Golf Course which is directly across the street from the entrance to The Whaler or drive 15 minutes to Kapalua and play the Bay, Village or Plantation Courses. The Plantation at Kapalua is home to the PGA Mercedes Championship which is played in the beginning of January every year. Premium location and uncompromising views make this home the perfect vacation choice for your discerning life style. We also have a beautifully remodeled 2BR/2 Bath (sleeps 6) 7th floor unit at Kaanapali Shores Resort. It can be found directly at VRBO # 192133. Enjoy Every day morning walks on the beautiful Kaanapali Beach, close by restaurants. Just walk to the Beach as you step out of the Resort. Wonderful restaurants close by. One of the best Snorkeling just few yards away. We will go back to The Whaler, but not to that unit! Beautiful view of ocean!!! E mails and questions were answered in a timely matter. Check in process took a very long time as front desk did not have our reservation. Location of condo was perfect! The grounds of the whaler are beautiful!!!! We have been vacationing at the Whaler for 30 years and this is the most most disappointing unit we have stayed in. The unit - especially the bathrooms - have not been updated and the decor is very plain. The kitchen has everything needed to cook meals. There is not a washer and dryer in the unit, but is one for shared use right across the hall which was great! The carpet was really, really soiled, a cabinet in the kitchen right beside the stove would not close which interfered with using the stove and the living room blinds did not work. Maintenance was there within the hour to check things out. We were given a piece of electrical tape to keep the door closed (which did not work) and he put the blinds up so we could see out, but were unable to close them at night to eliminate outside light and remained that way throughout our stay. The carpet issue was never addressed! Again, the location and view could not be better!! We love the Whaler!!!! The whole experience at the Whaler, in the condo, and dealing with the owner was very easy. Property is as described the and Whaler is a very well maintained property with easy parking, check in and a full range of facilities....much like staying at a more expensive hotel, but with the advantages of a condo. Location is perfect... on the beach next to restaurants, fast food and the great ABC store. We recommended this property to family and friends.....and we will be back. We've been coming to Maui regularly for the past 15 years and this has been our favorite trip so far. The location of the Whaler is absolutely excellent. We loved the superb swimming beach and the proximity to Whaler's Village for great meals at Leilani's and Hula Grill. We also really enjoyed the pool which always had loungers available and was not as noisy as most since the resort doesn't have many young kids about. Please note that the pool is deep -- 4"ft - 6ft which was too deep for our very tall 6yo to stand. The unit itself was very nice with a beautiful ocean view and all the amenities we needed. The bed in the bedroom was very comfortable but the sofa bed would have been very uncomfortable for adults. Our 6 yo didn't seem to mind. Ashvin was a pleasure to work with. Thanks for a great stay and we look forward to coming back on future trips. We are glad that you enjoyed our condo and the wonderful views it offers. We surely welcome your comments on the Sofa Bed and are planning to replace it with a Murphy bed in the future. We look forward for you to visit us again in the future. Excellent location for whale watching and sunsets and at a great value! This is the third time we have stayed at the Whaler and we are never disappointed in our decision! We love the location of this unit - its on the sunny side but there's still some shade on the balcony to escape the sun if it's too hot. We actually thought the music from below was really good, but not loud enough, so we had to bring our own music out on the balcony. No one was visible on any of the balconies around us, so I'm guessing no one minded! I love the double bathroom with roomy vanities in these units! The bed was slightly firm for us, but we had a great night of sleep! The A/C worked great, also, on the muggy days. It was a whale watching show from the balcony every night - fantastic! Perfect sunset location, too. There are 2 small soaps per bathroom and coffee included in the rental. Huge closets, too. The carpet needs to be cleaned in a few spots, but for a beach rental, I was more than excited when we walked in the door! I will definitely rent this unit again! Amazing views. Great location. Some noise but it was not a burden. Great music we could hear from down the Whalers Village. Not all day. Very quiet after 10:00 pm. Always something to see and enjoy. We enjoyed looking at the people down at the Village having fun. Great happy hour at the restaurants down bellow. We had everything we need for our stay, except wine opener which we bought and left it for you. The unit needs some updating, but it was ok. We had a great time. Thanks Ashinc. All Guests must pay in addition to room rate One Time Check-out Cleaning Fee of $210. Resort Fee of $16/night (parking and other use of facility) is applicable to all registered Guest, with or without a vehicle. The Front Desk will collect the Resort Fee upon Guests’ departure. Optional Mid-Stay cleaning can be requested at an additional fee.